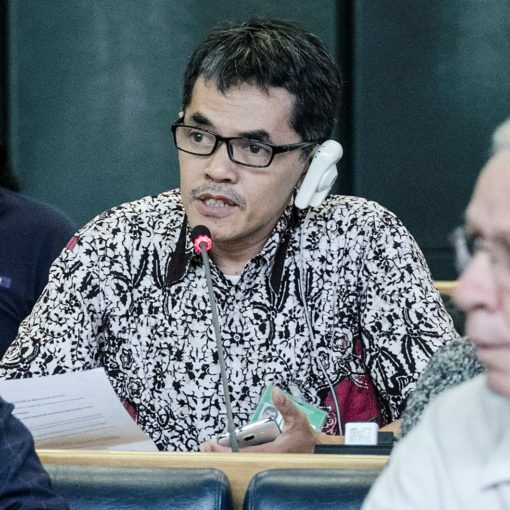 I am P.P Sivapragasam, a member of the Coalition of Agricultural Workers International (CAWI) and representing the Civil Society Organizations. First of all, I would like to table here our deepest sadness that one of our CSO colleague and an international activist Ms Chandrika Sharma from India was on Malaysian Airlines flight MH370 that is still missing until today. She was to attend this conference. The whole CSO community offers our prayers for her safety. We, 38 representatives of small farmers, landless, rural women, fishers, agricultural workers, forest dwellers, pastoralists and herders, indigenous peoples, urban poor, consumers, youth and NGOs coming from ten (10) countries met from March 8 to 9, 2014 in conjunction to the 32nd FAO Asia Pacific Regional Conference in Mongolia. We are confronted with intensifying economic, social and environmental crises in this region. Neoliberal policies of trade liberalisation, privatisation and deregulation facilitated by international trade and financial institutions have benefited transnational corporations and the elites of our countries. It has reduced the capacities of countries and peoples to ensure self-sufficient food production and right to food for everyone. It has worsened hunger, poverty, malnutrition, and contributed to the displacement, landlessness, loss of livelihood and income, and curtailment of rights of small food producers and consumers. Small farmers are victims of landlessness, displacement due to land grabbing, expansion of larger plantations and so-called development projects such as mining and dams, crop and land use conversion, high cost of inputs, and non-implementation of genuine land reform. As agricultural workers, we are faced with low wages, job insecurity including contractualisation, flexibilisation, and poor and hazardous working condition and lack of social security and benefits. As indigenous peoples, our rights to own, control and manage ancestral territories critical to our livelihood and survival are still not been recognised. There is also lack of respect and recognition of customary practices, laws, roles and contribution in sustainable agriculture and biodiversity managements systems. Many fishers and fish workers including women are being marginalised due to the expanding corporate and commercial fisheries and intensified aquaculture. Their tenure rights to land and access to fisheries resources in the coastal and waterfront area have been ignored. The health of aquatic ecosystems and biodiversity is not protected and there is also a lack of support for processing and marketing for fishers. The rights of pastoralists are not recognised, exacerbated by the lack of political, economic, and socio-cultural mechanisms and processes to protect those rights. Pasture and common land is being taken away from them in the name of so-called ‘development’. Because of depressed wages and unemployment, the urban poor suffer from lack of accessible, safe, nutritious and affordable food, without access to basic social services, apart from squalid conditions in slums and informal settlements that affect their health and wellbeing. Due to lack of jobs and livelihood and displacement from their lands, a significant number of rural and urban population, most especially the youth, are forced to migrate in cities and abroad contributing to the decline on the youth involvement in agricultural production. Rural women, particularly, remain invisible, undervalued and unrecognised despite their being seed savers, land tillers, community leaders and family managers. In addition, gender inequalities continue to exist in terms of access and control over resources, training, agricultural inputs, among others. 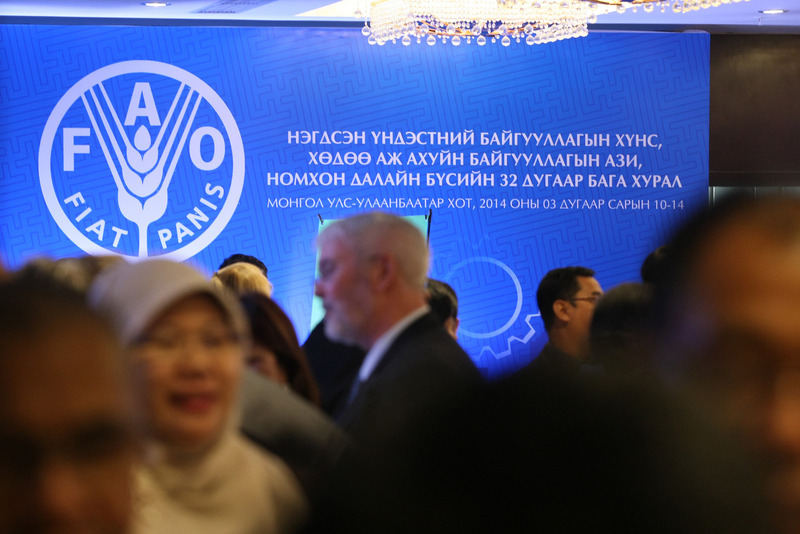 We recognise FAO’s efforts in promoting family farms in the midst of hunger, the need for sustainable production and recognition of rights of women. Violence against women and their discrimination in families and communities has to end. Family farming should not be seen as promoting landlordism, but should be done to serve the community and undertaken in a collective manner. 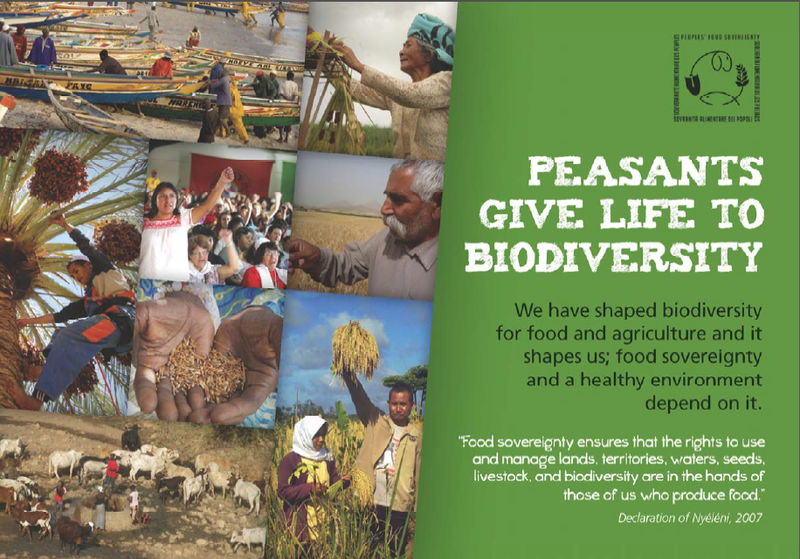 Food sovereignty is the key to food security and eradication of hunger and poverty. It recognises and upholds the rights of peoples to decide their own food and agricultural policies and the right to develop ecologically, socially, economically and culturally appropriate food systems. 1. Implement genuine agrarian, aquatic, forestry and pastureland reform that incorporates the right to resources including water, seeds, and the protection of ancestral domains and territories for the small food producers. We also call for women’s equal rights to resources. 2. Enact and implement laws and regulations that incorporate the principle of Free Prior Informed Consent (FPIC) and its monitoring system. 3. Promote and support agro-ecological, integrated, diversified farming, fisheries and livestock that protect traditional rights of peoples, local and indigenous knowledge and wisdom, rights to genetic resources, ecosystem-based resource management; and the conservation of local climate-tolerant varieties. These would also provide the basis of communities’ resilience on climate change. 4. Provide adequate public financing and financial services; facilitiate farmer-led agricultural research and provide extension services, appropriate technologies, trainings; develop local markets, infrastructure and create jobs — all targeted to benefit small food producers, particularly rural women, urban poor and youth. 5. Stop the promotion of corporate technologies such as genetically engineered seeds, highly hazardous pesticides, and agrofuel plantations that feed corporate profits. These devastate the livelihoods of small food producers, increase the risks to human health and environment and undermine peoples’ right to safe and nutritious food. 6. Enact laws and mechanisms that provide affordable and stable prices for staple and basic food products for the poor. 7. Help build capacities of small food producers to organise themselves into farmer’s organisations or cooperatives to have economies of scale and better bargaining power. 1 Ensure meaningful participation of social movements and CSOs in the formulation, implementation and monitoring of policies and guidelines such as the VG on land tenure system and small-scale fisheries. Strengthen the engagement of CSOs with national FAO offices in national policy formulation, strategic programmes and monitor its progress. 2 Continue dialogue on the concept of family farming considering different context and situation of small food producers; establish national committees that are farmer-led; and to take action to initiate policies and programmes that serve the small food producers and their communities. 3 Ensure that the rai principles include the central role of small food producers in food production and as primary investors in agriculture. The rai principles should protect the rights of small food producers’ against massive land and resource grabbing. It should be based on human rights, on the FPIC principles, peoples’ right to development, and labour and migrants rights. 4 In the rice key strategic options, we call for the halt of dependence on external inputs such as genetically engineered crops, hybrid rice and biofortification and instead focus on farmer-led appropriate technologies to address safe, nutritious and balanced diet. 5 Recognise that forest dwellers are food producers and protectors of the forest and natural resources and support their initiatives on climate change mitigation. Projects for forest restoration and reforestation should be done in respect of forest dwellers and their future generations. 6 Ensure participation of small-scale fishers in monitoring and evaluating the impact of intensified aquaculture and ensure that the program does not reduce the availability of resources to small fishing communities. 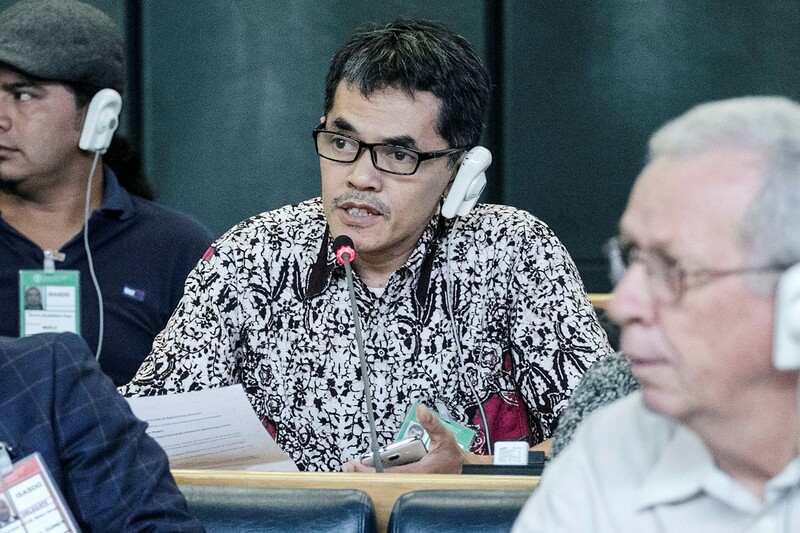 We, the civil society participants, are committed to working together with FAO, our governments and other international institutions that are accountable in meeting the needs of small food producers and their aspirations for food sovereignty. We affirm our right to self organise and autonomy. We appreciate this opportunity given to CSO’s to make our voices heard, make critical positions and recommendations on food security and agricultural development. However, concerns remain about our meaningful participation. Meaningful participation must mean that our recommendations are considered and included in the APRC reports. We will resist any positions, policies and programmes that undermine the rights of small food producers. We will strengthen our movements of small food producers to advance food sovereignty and gender justice. Thank you Chair for giving us this opportunity. Small food producers include small farmers, landless, rural women, fishers, agricultural workers, forest dwellers, indigenous peoples, pastoralists and herders.